Just twenty-six miles off the coast of Los Angeles, Santa Catalina Island became the home of the Union Army for one mysterious year. On January 2, 1864, eighty enlisted men under the command of Captain West occupied Catalina Island and forced the evacuation of its residents. By the end of the year, they were gone as quickly as they had arrived, leaving only their barracks behind. But why? The army remained completely silent about their intentions for the island and as a result, it has led to much speculation about their motivations. This forgotten military operation seems to be an inconsequential event in the scope of the Civil War, but this occupation reveals some of the larger issues that consumed California 150 years ago. While we may never definitively know why the Union Army occupied Catalina, the presentation outlines three plausible scenarios. Could it have been to protect the coastline from Confederate privateers? Could it have been motivated by the allure of gold and silver mining? And what could be the possible connection to Indian wars in Eureka? Heavily researched utilizing firsthand accounts and other primary sources, the presentation will attempt to answer all these questions through a PowerPoint presentation. The Union Army barracks are still standing in Catalina and although it is privately owned today, the Professor Batham was granted a rare opportunity to photograph the interior of the original structure and will be sharing those pictures with the group during the presentation. Steve Batham grew up in Los Angeles and spent several summers in Catalina. After receiving his B.A. and M.A. in history from CSU, Northridge, he lectured at his alma mater, College of the Canyons, and with students abroad at the University of Vienna. Steve moved to the Bay area in 2012 to teach at Foothill College where he serves as a professor of U.S. and Latin American history. This entry was posted in Meeting archive on October 15, 2014 by hlj. Q#1 – What rifle was the most common weapon carried by Union infantry in the eastern theater in 1861-62? Q#2 – Tests conducted by the U.S. Army were performed to determine which caliber bullet (.58 or .69) was more accurate at a distance when used with a rifled musket. What were the conclusions of those tests? Q#3 – What was the most widely used weapon by the Confederates during the Civil War? Q#4 – What rifle was very popular with Confederate snipers because it was capable of hitting a man sized target beyond 1,000 yards? Q#5 – What was the largest produced and most widely used of all handguns in the Civil War by both sides? Q#6 – What was the name of the handgun designed by Jean Alexandre LeMat that proved to be the favorite of General Jeb Stuart? Q#7 – What were the names of the two general types of artillery weapons used during the Civil War? Q#8 – What artillery piece was considered the weapon of choice if the opposing forces were concealed behind terrain features or fortifications? Q#9 – What was the name of the factory located in Richmond, Virginia, that produced a large quantity of Confederate weapons? Q#10 – What is the name of the term used to modify the barrel of a cannon which adds spiral grooves along the inside of the gun barrel for the purpose of spinning the shell or shot thereby increasing the range and accuracy of the gun? Q#11 – Did an Artillery Shot projectile include an explosive charge? Q#12 – What was the effective range of an artillery canister projectile? Q#13 – What was the name given to the two-wheeled carriage that carried an ammunition chest and was connected directly behind a team of horses and towed the artillery gun? Q#14 – What was the purpose of the piece of artillery equipment called a Caisson? Q#15 – What was the name of the company that was the Colt Firearms Manufacturing Company’s chief rival in providing weapons to the Union Army? This entry was posted in Quiz on October 12, 2014 by hlj. Nested between the Siege of Fort Sumter and the Battle of First Bull Run (aka First Manassas) during the spring of 1861 is the often overlooked action at Big Bethel church, Virginia, on June 10th, 1861. Many historians and Civil War enthusiasts consider this action the first true battle of the war. Unfolding political and military events quickly turned Virginia into the first active theater of campaigning for Union and Confederate armies. The Yorktown Peninsula soon became the first contested area within that theater. Conceived by local Union Army leaders as raid to stop Confederate pickets from harassing Union troops, Big Bethel instead became the testing ground for two citizen armies that were mustered, equipped, trained, and deployed over a six-week period following Fort Sumter. Union volunteer regiments attacked Confederates led by John Magruder and Daniel Harvey Hill for three hours. What happened that day and its results were the focus of national attention on both sides until Bull Run six weeks later. This entry was posted in Meeting archive on October 8, 2014 by hlj. Q#1 – The flamboyant Confederate cavalry commander of the Army of Northern Virginia went by the name Jeb Stuart. What did the letters J.E.B. stand for? Q#3 – What was the name given to the cavalry brigade that George Armstrong Custer commanded at the Battle of Gettysburg? Q#4 – What was the nickname given to Confederate cavalry battalion commander John Singleton Mosby? Q#5 – During the Civil War, what was the main mission of cavalry for both the Union and the Confederates? Q#6 – What was the nickname Union cavalry troopers gave to Union commander Hugh Judson Kilpatrick? Q#7 – It is well known that JEB Stuart was killed at the Battle of Yellow Tavern. Who was the Union cavalry commander at that battle? Q#8 – What is the name of the battle that was the largest predominantly cavalry engagement of the American Civil War, as well as the largest ever to take place on American soil? Q#9 – What was the name of the Union cavalry commander who repulsed a flanking attack by Confederate Nathan Bedford Forrest that was instrumental in saving the Union Army at the Battle of Franklin in November 1864? Q#10 – He was nicknamed the “Black Knight of the Confederacy”, commanded Stonewall Jackson’s cavalry forces in the Valley Campaign and was killed in battle in 1862—what was his name? Q#11 – How was Confederate general and cavalry officer John Hunt Morgan killed? Q#12 – What was the name of Union cavalry general Philip Sheridan’s horse? Q#13 – After Jeb Stuart was killed at the Battle of Yellow Tavern, who was named commander of the Confederate cavalry of the Army of Northern Virginia? Q#14 – John Buford commanded two cavalry brigades on July 1, 1863 at the Battle of Gettysburg. What were the names of the two brigade commanders? Q#15 – He was considered the tactical master of modern 19th-century mounted forces and wrote a cavalry tactics manual just prior to the Civil War that became the training and fighting textbook for troopers from both sides, and was called “The Father of the United States Cavalry”—what was his name? This entry was posted in Quiz on October 8, 2014 by hlj. This entry was posted in Meeting archive on October 7, 2014 by hlj. Civil War Quiz: What Do You Know About Robert E Lee? Q#1 – What was Robert E. Lee’s birth date? Q#2 – Who was Lee’s father? Q#3 – What year did Lee enter West Point? Q#4 – What was Lee’s major course of study at West Point? Q#5 – How many demerits did Lee incur during his 4 years at West Point? Q#6 – Lee married a woman named Mary Custis. Who was her grandmother? Q#7 – During the summer of 1835, what job was Lee assigned? Q#8 – How many children did Robert & Mary Lee have? Q#9 – During the Mexican–American War, what was Lee’s job in support of General Winfield Scott’s march from Veracruz to Mexico City? Q#10 – In 1852, what job was Lee assigned at West Point? 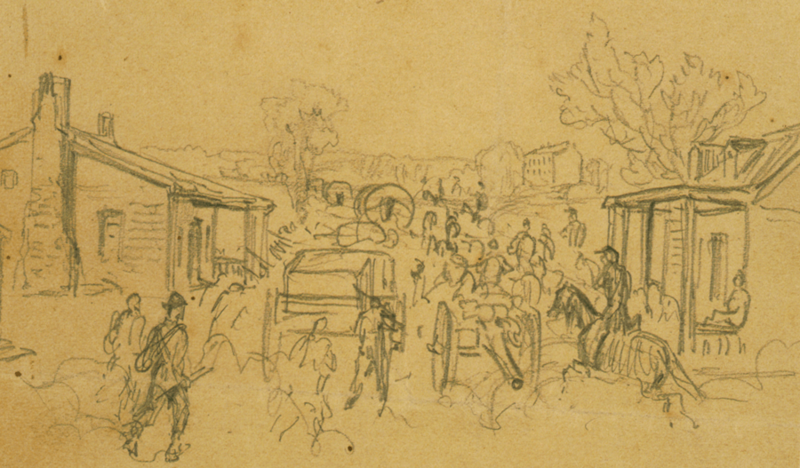 Q#12 – On August 8, 1863, following the battle at Gettysburg, Lee sent a letter to President Davis. What did the letter contain? 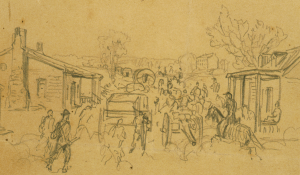 Q#13 – After the Civil War, what job did Lee undertake? Q#14 – What were Lee’s views on granting Negroes the right to vote? Q#15 – Lee died October 12, 1870. What medical malady occurred two weeks prior that contributed to his death? This entry was posted in Quiz on October 5, 2014 by hlj. As part of the 150th anniversary of the American Civil War, the Gettysburg College Civil War Institute hosted its Annual Summer Conference. One of the featured events was “U.S. Grant and the Virginia Campaign in 1864,” presented by Brooks Simpson, an American historian and History Professor at Arizona State University. Simpson is the author of six books, the coauthor of two more, and the editor or coeditor of eight other books and is perhaps best known for his work on Ulysses S. Grant. 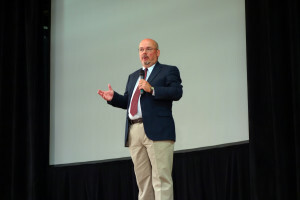 At the Gettysburg College Civil War Institutes’s Summer Conference held in June 2014, Professor Brooks Simpson discussed Union General Ulysses S. Grant’s Overland Campaign, which was a series of battles fought in Virginia during May and June of 1864. Simpson discusses numerous little known facts such as how Grant’s initial plans for taking over command in the eastern theater of the Civil War were vetoed by then Secretary of War Edwin M. Stanton. The presentation discusses how Grant’s role as commander developed and evolved in the Eastern Theater of the Civil War during the 1864 period. The presentation will be a video streamed from C-SPAN’s web site. This entry was posted in Meeting archive on October 3, 2014 by hlj. Civil War Quiz: What Do You Know About Ulysses S. Grant? Q#1 – What was Ulysses S. Grant’s birth date? Q#2 – What was Ulysses S. Grant’s birth name? Q#3 – What town and state was US Grant born in? Q#4 – How did Grant’s name get changed to Ulysses S. Grant? Q#5 – What nickname did Grant go by when at West Point? Q#6 – Grant graduated from West Point in 1843 with a class of 39 – where did Grant rank in his class? Q#7 – Grant fought in the Mexican War. In his memoirs, what did Grant write about his thoughts on that war? Q#8 – What was the maiden name of the woman that Grant married? 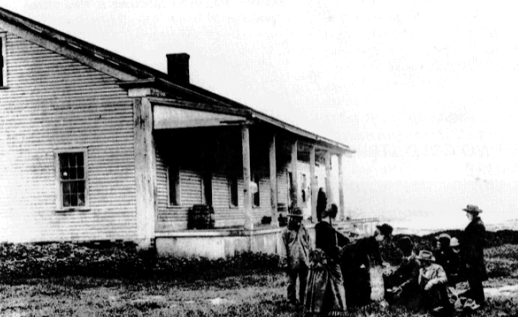 Q#9 – In 1856, Grant and his family moved to a section of his father-in-law’s farm and, to give his family a home, built a house. What name did he give to the house? Q#10 – Early in the Civil War, how did Grant earn the nickname “Unconditional Surrender” Grant? Q#11 – What was the month and year when President Lincoln named Grant commander of all Union armies? Q#12 – What was the reason Grant declined President Lincoln’s invitation to attend together a play at Ford’s Theater on April 14, 1865? Q#13 – What was the name of the Democrat Party’s candidate that Grant defeated in the Presidential election on 1868? Q#14 – After leaving the office of President in 1877, what did Grant and his family do? Q#15 – What was the medical condition that Grant eventually died from? This entry was posted in Quiz on October 1, 2014 by hlj.